Nail Stamping is fun to do but some time its not a joyride with all the headache of cleaning scrapper stamper every time, problem is picking up images etc etc. So,today I am here with a new stamping style. The set comes with a rubber stamper which has engraved design on it, 2 stamping polishes and a wooden popsicle stick. The instruction to use the kit are mentioned on the back of the packaging. 1. apply your base color and let it dry completely. After that apply stamping polish over the image, you want to stamp with( marked as 1 in above picture). 2. Lightly dab the stamper 5-6 time on a piece of paper to get rid of excess polish on the stamper ( marked as 2 in above picture). After that you can clean any unwanted polish remaining on the sides on stamp using the wooden stick. 3.Now press the stamp on your nail for few seconds. The stamp will transfer on your nail(marked as 3). 4. Finally apply top coat. Above pics are with no top. Love the effect. This pink ENAS stamping polish is perfect. I did try this over black base and stamped very well. You can create multicolor images in a single go using ENAS kit. I will write a post on that later. Overall, I am happy with the kit and its uses. 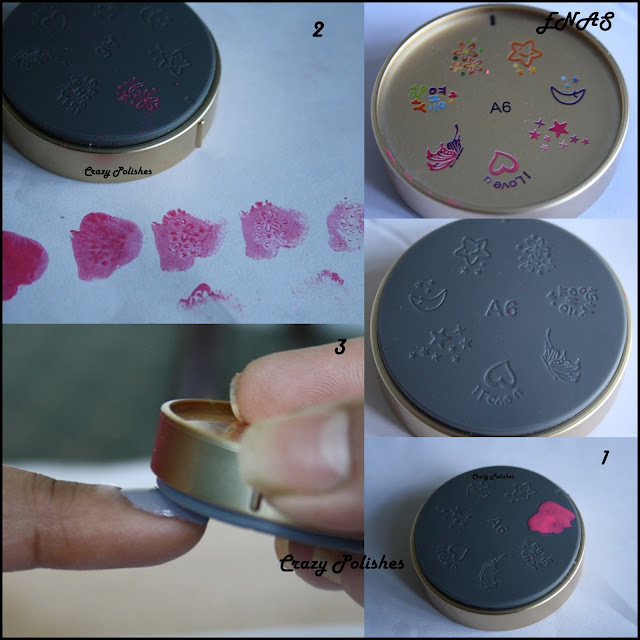 Perfect for beginners and for those who doesnt like normal stamping mess. These polishes and stampers are also available separately. i have tried all the images on this stamper and they turned out great, however i am not sure of full nail stamps. ENAS kit can be buy from here. You can also contact ENAS on Facebook. Please do share what you think about this or your experience. Thnx sweet, indeed it is. I love how quickly it stamps and how we can create multicolor images with it unlike regular stamping. it is .. do u like stamping? but the stamp only works using their nail polish right? hmmmm.. does look interesting..but is it better than konad? Thanks for posting this. 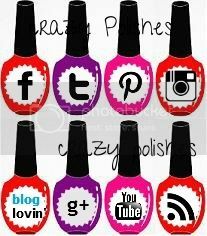 I love all things nail art and am looking forward to investing in this system. It seems to me looking at the 1st and 2nd photos, they are 3 dimensional. I love it! Have a great rest of the weekend! Happy polishing!